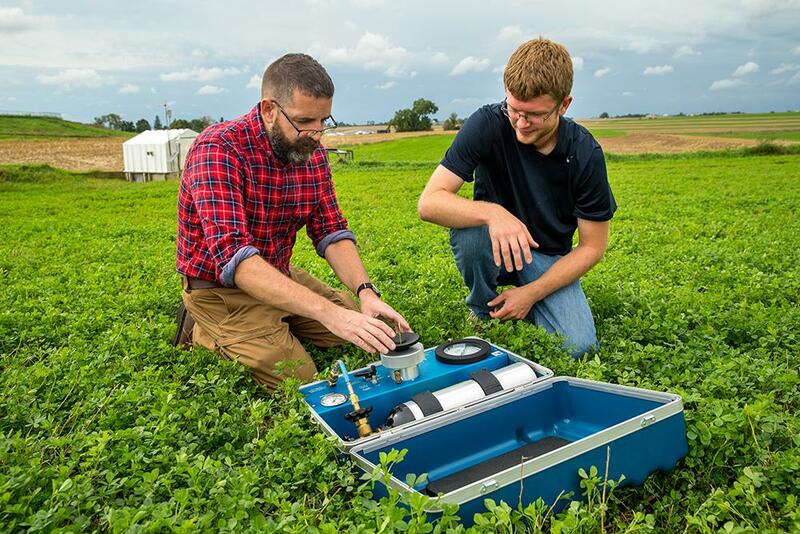 (from left) Dr. Andrew Cartmill, assistant professor of agriculture and principal investigator on the project, sets up research equipment while Brett Pluemer looks on. PLATTEVILLE, Wis. – How do agriculture producers meet the world’s increasing demands for food, fiber and fuel using the same amount of agricultural land? To help answer this question, a team of University of Wisconsin-Platteville researchers – in collaboration with both local and global partners – have been exploring best practices for sustainable agriculture for the past several years. The group recently received a United States Department of Agriculture grant of more than $270,000 that will allow for continued and expanded research for the next three years. Dr. Andrew Cartmill, assistant professor of agriculture, is the principal investigator on this project, collaborating with Dr. Dennis Busch, senior scientist at Pioneer Farm. The project will build on research and outreach the two have done over the past several years, including important collaborations with the USDA Long-Term Agroecosystem Research Network; the Global Farming Platform; Lafayette Ag Stewardship Alliance; and The Soil and Water Health Coalition from Jo Daviess County, Illinois; and a local farmer research steering group, which consists of more than a dozen diverse members representing beef, swine, dairy, organic and crop farms. The team will partner with Peak Forage Products, LLC in Hollandale, Wisconsin, to conduct plot scale research. This allows them to use land that is divided into plots, testing variables on each plot and screening results before potentially upscaling it at Pioneer Farm. The plots will be used to evaluate alternative cropping practices and their effect on improved production and sustainability. The exact variables to be tested have not been finalized yet – as the research team hopes to receive input from the farmer steering group first – but they will likely include diversification of crops, intercropping and cover crop methods. The research may also use a rainfall simulator and rainout shelters, therefore adjusting the localized climate for a given plot to test if the mixture of plants and production technique can overcome that condition. The project takes a comprehensive approach to integrating the research with education and outreach components, which will help ensure its value to the local farming community. In addition to leaning on the local farming community for input, Cartmill hopes to involve a number of UW-Platteville students. “We think students should be at the table when discussions are happening because this is their future,” said Cartmill, adding that the exact number of students who will be involved in the research is not known yet, but he estimates it will be more students than he has ever had involved in past research projects. Students will also have an opportunity to participate in an undergraduate research experience implemented through short-term immersion programs at the local and international level, including sites in the United Kingdom, Uruguay and India. The project funding is provided through the USDA National Institute of Food and Agriculture, Capacity Building Grant for Non-Land Grant Colleges of Agriculture Program. Additional collaborating agencies include School of Veterinary Science, University of Bristol United Kingdom and Rothamstead Research, North Wyke, United Kingdom, along with USDA-ARS National Laboratory for Agriculture and Environment in Ames, Iowa.